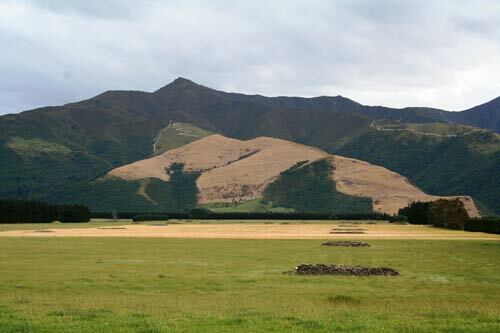 Mt Peel station in South Canterbury is a property that has successfully gone through tenure review, in which farmers can gain freehold title to leased land in return for giving up some land for conservation. The division between the newly acquired freehold land and the conservation estate is marked by the bulldozed tracks. The bush at left remains Department of Conservation reserve, while the cleared land to the right will continue to be farmed in private ownership.